Police on Wednesday released composite sketches of two men sought for questioning in a fatal shooting last month in Lillington. Police say Quentin McKoy was killed around 8:30 p.m. on July 29 during a robbery at a home on Cedar Grove School Road. They haven’t released any other details about the crime other than to say they believe the two men might have been driving a dark-blue or black Dodge Charger. 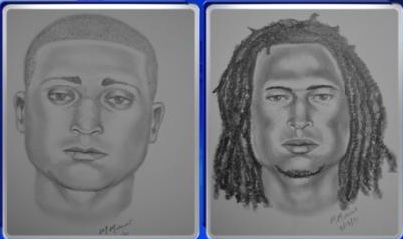 According to the drawings, one of the persons of interest is a light-skinned black man with a thin build who stands about 5 feet 10 inches tall. He has close cropped hair and is dark around the eyes, police said. The second is a dark-skinned black man with a medium build who stands about 5 feet 8 inches tall and had shoulder-length dreadlocks and skin hair. Police consider the men to be armed and dangerous and ask that anyone with information about the men to call the Lillington Police Department at 910-893-3015 or 910-893-9111.